This is a weekly column from freelancer Rowan Kaiser, which primarily focuses on "Western" role-playing games: their stories, their histories, their mechanics, their insanity, and their inanity. This week, however, Rowan focuses on a forgotten JRPG: Grandia. One of the core issues facing most role-playing games is how they deal with repetitive combat. Since RPGs tend to be so much longer than normal games, with a wider scope, it's much more difficult for them to create unique battles like a shorter action game can. So RPGs tend to have constant, similar, repetitive fights. These are often derided by players and critics under umbrella terms like "random battles," "grinding," or in massively multiplayer games, "trash." Yet RPGs need those regular battles to keep the games interesting. With rare exceptions, the player skills are unlikely to be tested in terms of skill outside of combat, and most RPG stories depend on violence and its consequences. This makes combat an integral component of the pacing of RPGs. Successful RPGs tend to strike a balance between combat, exploration, and storytelling. When one of those three part is left unchecked, the game can become boring – and it's usually excessive repetitive fighting that's the issue. For decades now, RPGs have attempted to make their regular battles more interesting, and less likely to be described as trash or grinding. Japanese RPGs have historically tended to experiment with different combat forms more aggressively than their Western counterparts. Some games, like the Suikoden series, tries to avoid the combat issue by making combat smooth and unobtrusive, as I wrote about in a prior column. But not every RPG can, or should, de-emphasize combat. When combat works, even in common random battles, it can be the best part of an RPG. How can RPGs avoid having combat be too repetitive and meaningless? Traditionally, individual fights are part of a longer string of battles leading to a large, difficult confrontation. Your characters' resources – healing items, hit points, mana points – have to be managed over time. There's no safe place to recharge after combat, unless you retreat back to town, or travel forward to a save point. While this makes conceptual sense, it rarely makes the individual battles more exciting. Instead of using all your cool spells and abilities, it encourages you to hoard them – when I play JRPGs, I almost never waste mana on a non-healing spell until I get to a boss fight. This battle structure also narrows the possibilities of difficulty. It means that most fights will be easy, unless you fail with your resource management and they become nearly impossible. Neither of those options are likely to make individual battles more interesting. Many recent narrative-based games, such as Final Fantasy XIII and the Dragon Age games, have changed that structure in ways that raise the stakes of each individual fight. They do this by having your health and/or magic recharge instantly or quickly as soon as combat ends, effectively meaning your resource management becomes focused on each individual fight. The fights are allowed to be a constant challenge, because hurting the characters there won't make it impossible for them to succeed later by forcing them to use all their potions: It's the RPG equivalent of shooters moving away from health packs and toward recharging health/shields. I find this approach generally successful at making combat more interesting, but that doesn't necessarily make the game better – it can focus attention away from exploration and storytelling, and it can also make apparently mundane sections of the game stressful and difficult. Another common approach is to make combat easy to spot and sometimes avoid. The chief difference in mechanics between Chrono Trigger and the very similar Final Fantasy games was that fights weren't random, but instead occurred when you bumped into on-screen enemies. This doesn't seem like a huge change in theory, but in practice it made it easier and less stressful to travel from one place to the next, since you knew exactly how many times you'd be interrupted. The sequel, Chrono Chross, went even further with the concept – you only actually gained levels by fighting boss fights. Random battles only filled out a few stats, with diminishing returns. That ended up backfiring, however, as it meant that many of the battles that couldn't be dodged felt even more useless. There's one game that handled the issue of repetitive combat so well that I'm shocked at how little influence it's had: Grandia, from developer Game Arts, released in 1997 on the Sega Saturn and the Playstation two years later (a game currently available for download on the PSN). While perhaps best-known for its conventional story and sometimes overly cute style, underneath the presentation was a simple, clever progression mechanic. Grandia had a large amount of both necessary and optional combat, with monsters displayed on-screen so you could fight or try to avoid them. What made it stand out what that it separated its skill improvement from normal experience gain. Skills were improved by practice and practice alone, and the game was transparent about which skills' improvements would lead to new abilities. Each character in Grandia had weapon skills and magic skills. The character Fiona can use whips and knives, and is also a powerful spellcaster. So if she fights with the whip, it will eventually reach the fourth level, and she'll be able to use the 'Para(lyze) Whip' ability. When her Water Magic skill reaches level three, she can cast 'Snooze' and try to put enemies to sleep. Skills combine for new abilities, like the ice-based attacked 'Crackle,' which unlocks at the third level of Wind and second of Water. This grows increasingly intricate through the game: the 'Zap! Whip' skill requires level 24 of Whip use, Fire 15, and Wind 15. 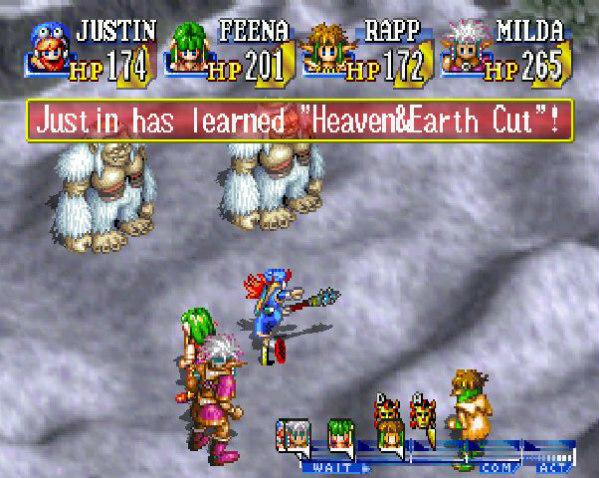 Therefore, when fighting normal battles in Grandia, there was a goal of improvement in each fight beyond simply winning without getting hurt. You'd want to use as many specific skills as possible in as many as fights as you could, because you were constantly working toward something new and great. I mentioned earlier how I hate to use magic in non-boss fights in most JRPGs; Grandia is the huge exception to that rule. Grandia's wonderful mechanic of practicing to achieve transparent goals went unnoticed and almost unused in RPGs since. 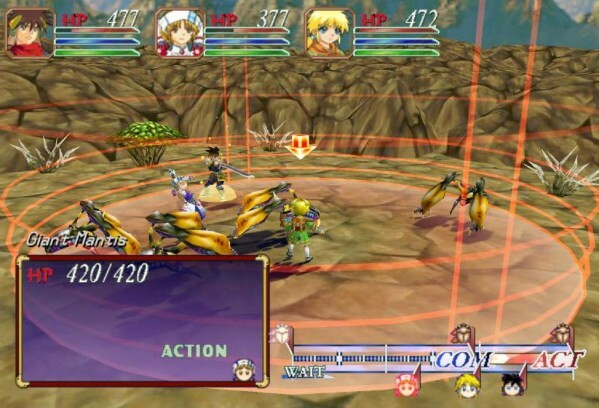 Even its own sequel, Grandia 2 (pictured above), reverted to a dull process of gaining skill points to spend on whatever you wanted, with practice rendered irrelevant. There are dozens of different ways that RPGs have attempted to deal with the repetitive combat problem, and there will certainly continue to be new attempts made. Grandia's practice-based structure isn't the only or possibly even best of those models. But it did work exceptionally well and it deserves to be remembered and included in conversations about how to make RPG combat less annoying. Rowan Kaiser is a freelance writer currently living the Bay Area, who also writes for The A.V. Club, and has been published at Salon, Gamasutra, Kotaku, and more. He still occasionally finds Ultima VI Moongate maps and mantra notes when he visits his parents' house. Follow him on Twitter @rowankaiser.